This Pottery Avenue's CLASSIC FLOWERING PEACOCK19” Baguette Serving Platter, is an oval shape giving a modern edge while the elongated shape puts more emphasis on the food being served. Approx Dimensions: 19.5" x 6.5" x 1.5"
The POTTERY AVENUE large Baguette Platter from is made in the Zaklady Ceramiczne factory in Boleslawiec, Poland. 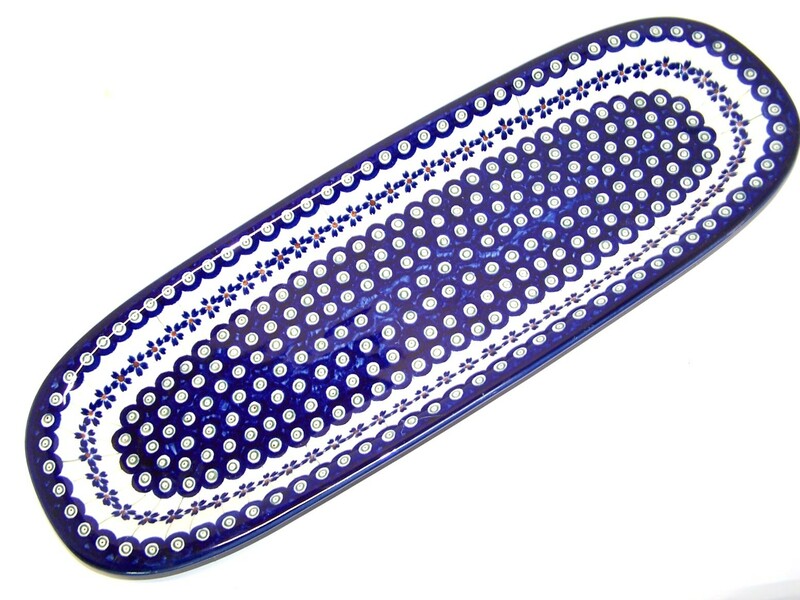 This 19", Baguette serving platter is safe to use with food and is complete with a lead and cadmium free glaze offering it an attractive appearance and easy cleaning. Designed in an elongated oval shape, this polish stoneware serving dish platter is an ideal choice for serving or presenting your food at home or any catered event, buffet, or restaurant for a stylish appeal. An oval shape also gives a modern edge while the elongated shape puts more emphasis on the food being served. Made with white firing clay and a high firing technique, called vitrification, this handcrafted Boleslawiec Stoneware is sure to stand the test of time. • Approx Dimensions: 19.5" x 6.5" x 1.5"
A national treasure, Boleslawiec ceramics have been manufactured for centuries. Developed from natural ceramic clay that can be found near Boleslawiec at the Bobr and Kwisa rivers. According to historical sources, the first stoneware was made in medieval times and in the early 16th century, local potters formed guilds to ensure perfection. Zaklady Ceramiczne "BOLESLAWIEC" was founded by one of the original men with the first pattern dating back to 1759. "FLOWERING PEACOCK 19" BAGUETTE PLATTER" is a CLASSIC pattern based of the 300 year old pattern "EYE OF THE PEACOCK". Designed by top designer and imported by Pottery Avenue, the premier importer of Polish Pottery & Polish Stoneware.